Airsoft Innovations keeps producing unique products that fill very important gaps in the airsoft market. First, they brought the first mainstream propane adapters, effectively reducing airsoft gas costs to next to nothing. They then came up with the first really effective and reusable airsoft grenade, the Tornado series, including the standard timer models and the very impressive impact design. Now, they are making reloading your gas powered guns and grenades in the field much easier, with the GasCan, a compact and rock solid gas container, that is much more convenient to carry and use than a standard propane container. I will discuss all of the various aspects of the GasCan in this mini-review! I was sent the GasCan directly by Airsoft Innovations, where is is currently for sale HERE, priced at $49.95. It was delivered via USPS, arrive safe and sound a few days after being sent out. It includes a bottle of GBB oil, and a propane adapter, which is specially chosen to keep your GBB pistol or rifle properly lubricated from the inside. AI will be selling it without the propane adapter for $39.95 later on. 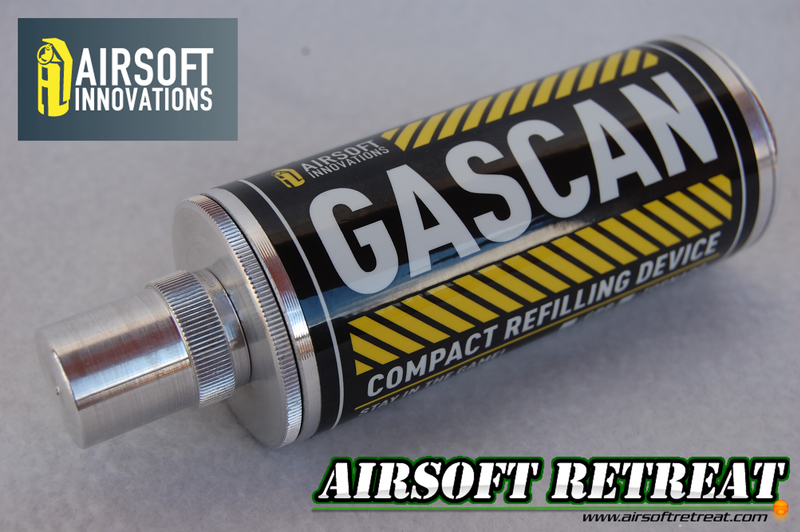 At the time of this writing, the GasCan is also available through Airsplat, Evike, and other airsoft retailers. 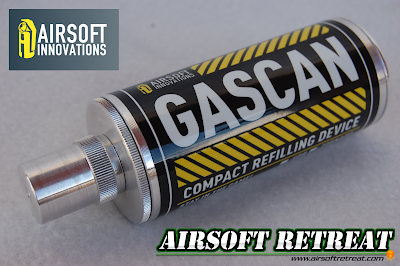 The GasCan is a metal, CNC machined container that holds gas to be used in gas powered airsoft replicas. It is small, about the size of a Red Bull can, only shorter in overall height. It is also quite lightweight, only coming in at 160 grams. The best part about it is that it holds quite a large amount of gas, enough to fill up 5-10 GBB pistol magazines, or 10 Tornado grenades. The GasCan is a multi-piece design, comprised of several metal parts that come together to form the body of the container. The main body is a machined cylinder, with fairly thick cylinder walls to prevent damage during use. The bottom cap is permanently attached, and houses the inlet fill valve, where you put the gas into the GasCan. The top is removable in order to add lubricant to propane. You can change the amount and type of lubricant that you use depending on if you plan on using this with GBB guns or Tornado grenades. Â It has a 16mm long metal fill nozzle on the top, which you use to fill up your magazine/grenade. The nozzle is protected by a removable cap to prevent damage while not in use. When you remove the top cap, you can see inside the container. This really shows you how huge of a gas capacity that this thing has, as the inside is basically just a huge open container. The top cap has a large O-ring to seal it up, and the threads are well cut to prevent them from seizing up or getting cross threaded. The compact size of this makes it easy to store this in your rig, and carry with you into the field. AI indicates that one will fit in a flashbang pouch, and two can fit in a double M4 mag pouch. You can get it into a 40mm grenade pouch as well, and after some small velcro adjustments, you can get it locked up securely. You can't really measure the performance of this thing, aside from measuring the amount of refills that you can do with it. Using my WE 1911 race pistol, I was able to get 9 refills of full power, and a 10th refill getting me 8 shots. Using my KJW SIG P226, I was able to get 6 refills of full power, and a 7th of only a few shots. It's not terribly quick, as you have to unscrew the protective cap first, but it is infinitely more convenient to carry this than a full size propane tank. It is also much safer than carrying a standard thin walled Green gas tank, and much cheaper in the long run using propane. Unlike some of the other gas chargers on the market, the GasCan doesn't leak, even after keeping gas in it all day. Airsoft Innovations' GasCan is a very useful tool for airsoft players, as it adds a lot of convenience to their GBB and grenade usage. Being able to carry a usable quantity of extra Propane/GG into the field in a sturdy and compact container is incredibly handy, and can keep you in the game longer. I'm certainly happy to have the GasCan on my gear! Many thanks again to Airsoft Innovations, and of course, Airsoft Retreat!